FarmBorough Festival Releases Full Lineup & Schedule! We are T-minus 36 days away from FarmBorough Festival, New York’s first country music festival, and what is sure to be one of the most memorable weekends of the Summer! The Festival just released the full lineup and schedule, so you’ll have plenty of time to plot which sets you’d like to catch. Canaan Smith will kick off the festivities first on the Main Stage Friday afternoon, while Luke Bryan will have you singing “I Don’t Want This Night To End” when he closes the fest Sunday night. In between, we can’t wait to catch Dierks Bentley, Kip Moore, The Railers, The Cadillac Three, Chris Stapleton, Logan Mize, Mickey Guyton, Maddie & Tae, Charlie Worsham, and more. Visit FarmBoroughFestival.com for the full schedule and get ready for when NYC Goes Country! In between sets, or when you need a break from it all, FarmBorough will have plenty of other activities! Everything from a giant slide to an epic burger cook off, and even a beach house! You’ll find us in the “Festival Fare” section, with some of our favorite eats from Luke’s Lobster and Handsome Hanks. Here’s a little Dierks Bentley throwback for you! Be sure to follow FarmBorough Festival & Secret Fangirls for more updates! One of our favorite Summer traditions is back for its 20th Anniversary season! 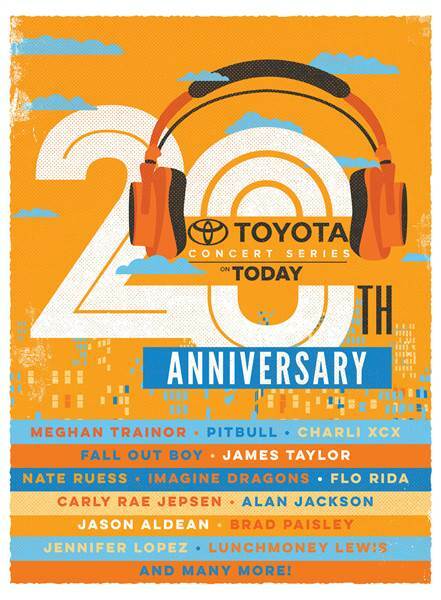 The TODAY Show unveiled the lineup for it’s 2015 Toyota Concert Series today. The lineup includes a mix of pop, rock and country artists, with more artists to be announced. All concerts are free and open to the public, and take place outside the TODAY Show studios at Rockefeller Center in NYC. FANGIRL TIPS: The concerts take place from 7am to 9am, although we suggest lining up quite a bit earlier to get a good spot! You’ll get to watch the artists’ early morning soundcheck, and hear around 3-4 songs during the live show. Sign up for the TODAY Show Concert Series Newsletter to be eligible to sign up for a Fan Pass to the show. A Fan Pass is awesome and lets you into the viewing area before the general public line! (You’ll still have to arrive no later than 6AM, but it’s so worth it.) Our thoughts on TODAY Show Concerts? Are you going to remember that Summer Friday you were well rested for work/school/etc? Or that time that Donnie Wahlberg serenaded you at 6AM? Watch Hunter Hayes perform on the TODAY Show Last Summer! Be sure to follow The TODAY Show & Secret Fangirls for more updates! 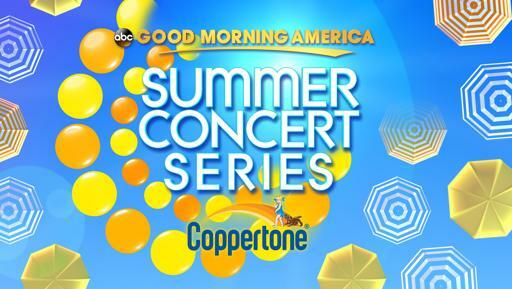 Good Morning America Summer 2014 Concert Series Lineup! Good Morning America revealed their Summer Concert series lineup this morning! While we’re a little disappointed by the lack of boy bands and other Secret Fangirl favorites, it’s still a solid lineup. And we always love to see country artists in New York! All shows are free and take place at Rumsey Playfield in Central Park. Just make sure to line up (early!) before the shows 7am start time to guarantee a space. Only the Jennifer Lopez and 50 Cent concerts will require an advance (free) ticket. Stay tuned for details. Unlike the Today Show concert series, there are no “fan passes” for GMA concerts. Attendees are encouraged to enter the park via the 72nd Street entrance on Fifth Avenue at 6am, when the park opens to the public. As we said in our Today Show Summer Concert announcement, what better way to start your day by than seeing your favorite artist before work/school etc? Follow GMA on Twitter for more updates!